Clean Eating Samoas. It that time of year again. When girl scout cookies are everywhere. Since we are now vegan, we cannot eat them. 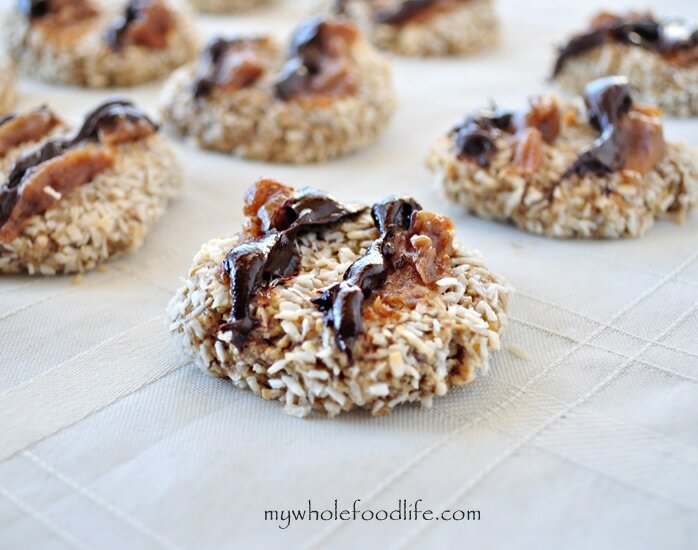 My husband was a huge fan of the Samoas, so he asked me to create a healthier samoa recipe. I can’t think of a single person who doesn’t like Samoas, can you? I think these healthy samoas came out pretty good. The base of this cookie was inspired by my Gluten Free Coconut Cookies. These healthier samoas are not only vegan, but they are also gluten free, dairy free and egg free. The taste of the girl scout cookie with none of the guilt! Place the almonds and oats in a blender and blend into a fine powder. This works great in a Vitamix . Pour contents into a large bowl . Add the almond flour and the coconut sugar to the almond/oat mixture. In a smaller bowl , add the coconut oil, applesauce, vanilla, eggs and milk. Mix well and add to the dry ingredients. Mix wet and dry just enough to combine. Place the shredded coconut in a small bowl and set aside. Take each ball and roll it around in the shredded coconut. Once it is covered, flatten it with your palm and place onto a lined baking sheet. To make the caramel, place the dates in a food processor or magic bullet and pulse into a thin sauce, slowly adding warm water to thin it out. Once it becomes the consistency or caramel, drizzle it over the top of each cookie. Once each cookie has caramel over it, place in the oven and bake for 11-13 minutes. As cookies are cooling, you can make the chocolate. Using a double boiler, melt the chocolate in a glass bowl slowly adding enough milk until you get a thin enough consistency. I added about 1/2 cup. Once the chocolate is thinned out, drizzle it over the tops and place in the fridge for the chocolate to set. Melissa, I copied this recipe years ago and finally made these cookies for Thanksgiving. Thank you; they are wonderful!!! Yay!! So glad you liked them Sue!